Predictive control is a powerful tool in dealing with those processes with large time delays. 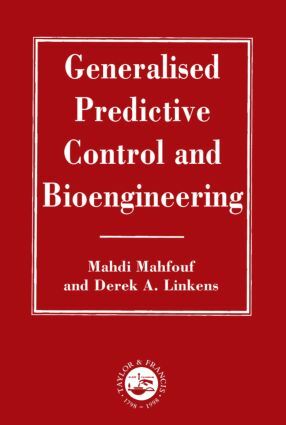 Generalized Predictive Control GPC is the most popular approach to the subject, and this text discusses the application of GPC starting with the concept of long-range predictive control and its need in medicine particularly automated drug deliveries. ; The concept of adaptation is also emphasized with respect to patient-to-patient parameter variations. Subsequent chapters discuss interactions, comparisons and various aspects of GPC. The book concludes by putting into perspective the generic nature of the architecture built around GPC and which provides model-based fault diagnosis with control. SISO generalized predictive control GPC in muscle relaxation therapy; propofol induced anaethesia - a comparative control study using a derived nonlinear method; multivariate generalized predictive control in the operating theatre; constrained mutlivariate generalized predictive control for anaesthesia - the quadratic programming approach QP; generalized predictive control with feedforward GPCF for multivariate anaesthesia; generalized predictive control with long-range predictive bidentification LRBI for multivariate anaesthesia; a comparative study between multivariable generalized predictive control and intelligent self- organizing fuzzy logic control SFOLC for multivariate anaethesia; generalized predictive control with prespecified set-points in clinical anaesthesia; supervisory generalized predictive control NLGPC for muscle relaxant anaesthesia.